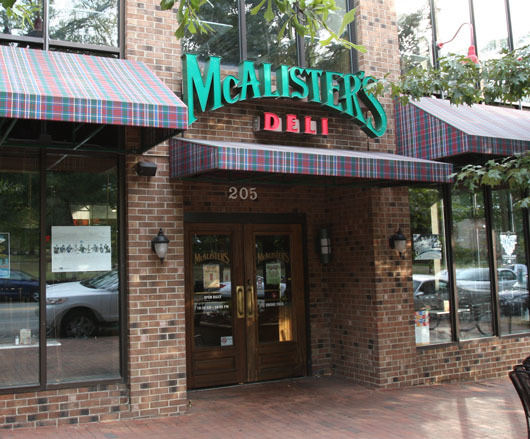 CHAPEL HILL, NC—Responding to questions about how his “big date had gone,” Eric Paulson, freshmen undecided major, confirmed with disappointment that his 3:30 pm Tuesday lunch date with classmate Samantha Richards at McAlister’s deli on Franklin Street had not, in fact, been a date. “If this date goes well, I don’t want to jump to conclusions, but I think we are both feeling something special,” he told them. On Tuesday, Paulson hurried back to his Hinton James dorm from his noon HIST 140 lecture, where he had waved at Richards before sitting on the opposite side of the lecture hall. He did the 15 push-ups he had performed daily since he decided to ask Richards “on a date” and took a thorough shower. Listening to the “We Made It” freestyle by Drake on repeat, Paulson dried off and flexed in the mirror of his securely locked dorm room. He chose a long-sleeved polo shirt and khaki shorts for his meeting with Richards, altering his usual look by tucking his shirt in and wearing the analog watch he kept on the top shelf of his closet for special occasions. Before he left the dorm, Paulson put on his Sperrys, which were still wet from a failed attempt to wash them in the laundry. He arrived at McAlister’s fifteen minutes early, and decided to walk to the Arboretum and back to avoid looking anxious about the meeting. When Paulson returned from his fidgeting loop of the upper Quad at 3:34 pm, Richards was waiting outside McAlister’s Deli in a white long-sleeved t-shirt and Nike running shorts, her hands on the straps of her large backpack. As they entered McAlister’s, Paulson paused to hold the door open for Richards, who, oblivious to his intentions, reached up to grab the door as well. They hesitated in the doorway, awkward eye contact compounding the miscommunication. Paulson wondered what he was doing wrong while Richards wondered what he was doing. Richards, who had already gotten out her wallet, looked at him in confusion. Paulson cast about for words. After Paulson made his order, forgoing his usual choice of the Big Nasty for the more conservatively named California Turkey Ruben, he suggested that they eat upstairs, hoping the secluded location in an already deserted restaurant would restore romance to the mid-afternoon meal. Richards said that she would prefer to eat outside in case her friend Caroline, who had just gotten out of class in Graham Memorial, wanted to say hello. Unsure how to interpret Richards casual approach to dates, Paulson acquiesced to the arrangement. Once outside, Paulson avoided eye contact, stalled on how to start-up the conversation. Breaking the silence, Richards asked when Luke, the third member of their project group, was going to join them. “Why would Luke come?” asked Paulson, fatuously. “I thought we were going to work on the group project,” replied Richards. The ambiguity of his fateful first Facebook message sunk in. Paulson saw all of his past actions in light of his emotional cowardice, of the poverty of his self-expression. He saw the ridiculousness of his fantasies, of the Tuesday afternoon he left open to endless possibility, hoping to hold hands as they walked back to South Campus, to kiss her as he left her at Craige, of the condoms he bought at Walgreens, of his entire life, and he wondered why anyone would ever eat at McAlister’s. “Yeah, I’ll text Luke,” he said.